Being a teenager isn't easy, but neither is being a parent and sometimes desperate times call for desperate measures. Luis has reached braking point with his sixteen-year-old-son. Fran's behaviour is starting to spiral out of control, he's drinking, smoking dope and constantly getting into trouble. Something has to be done. In desperation, Luis makes a decision that will change both their lives forever. After being violently dragged from his bed and thrown into a waiting van, Fran can only imagine what's going on and where he's being taken. The staff at Tranquility Valley claim to re-educate ‘problem children' to teach them how to live as an integrated part of society and show respect and discipline. For Fran and the other problem kids, this will be the hardest lesson they have ever had to learn and one they will never forget. The first film directed by cinematographer Xavi Giménez (whose photography credits include The Machinist) stars Marcel Borràs, Carlos Cuevas, Cristina Dilla and Irene Escolar, and was executive produced by Carlos and Julio Fernández, the pair behind the successful [Rec] films. 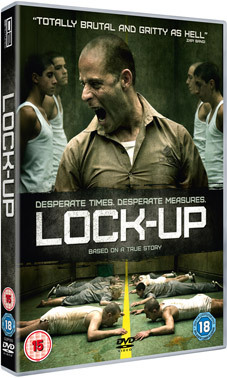 Lock-Up will be released on UK DVD on 8th August 2011 by G2 Pictures at the RRP of £15.99. No extra features have been listed as yet.